1. Fully stnchronized label appplicator, Top stabilizer and conveyor system. 2. 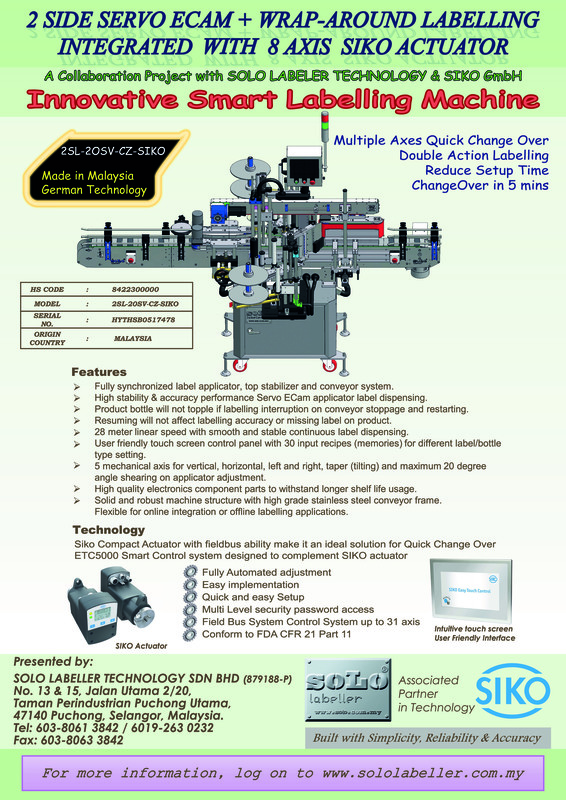 High Stability&accuracy performance Servo Ecam applicator label dispensing. 3. Product bottel will not topple if labelling interruption on conveyor stoppage and restarting. 4. Resuming Will not effect labeling accuracy or missing label on product. 5. 28 meter linear speed with smooth and stable continous label dispensing. 6. User friendly touch screen control panel with 30 input recipes (memories) for different label/bottle type setting. 7. 5 mechanical axis for vertical, horizontal, left and right, taper (tilting) and maximum 20 degree angle shearing on applicator adjusment. 8. Solid and robust machine structure with hight grade stainless steel conveyor frame. 9. Flexible for online integartion or offline labelling applications.